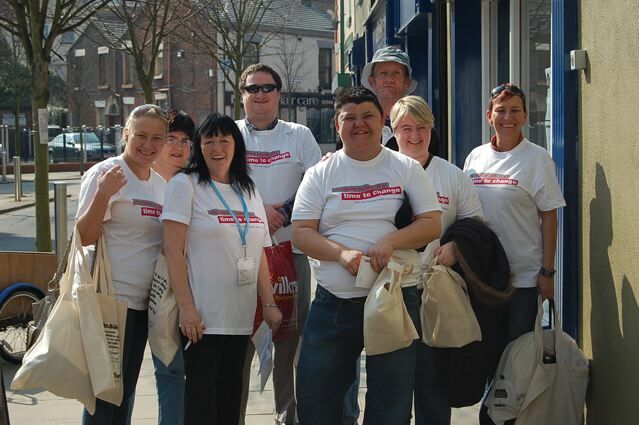 Members of the Oasis Group were in St Helens last week to promote the latest campaign from time to change. They gave out new materials from the campaign including postcards, posters and information leaflets. The new campaign ‘It’s time to talk. It’s time to change’ aims to address the awkwardness people feel in talking about mental health problems, and get people talking about mental health. The Oasis group meets every Monday morning at the United Reformed Church, King St, St Helens and is open to everyone. Volunteers run various activities including bingo and quizes, and there is plenty of time for a coffee and a chat. They can also tell you about other groups in the Borough, including the Forum, Peer Support Network and the women’s group. Whether it’s fear or awkwardness about talking to someone we know about their mental health problem – or talking about our own mental health problem, reluctance to talk about mental health isn’t good for anyone. Talking openly about mental health takes the taboo out of something that affects us all.